Microsoft has rolling out Windows 10 PC Preview Build 14942 for insider members in Fast ring with a list of all the new features, bug fixes and improvements, and known issues. To update latest Build 14942, launch the Settings app and search for Update & security > Windows Update > Check for updates. 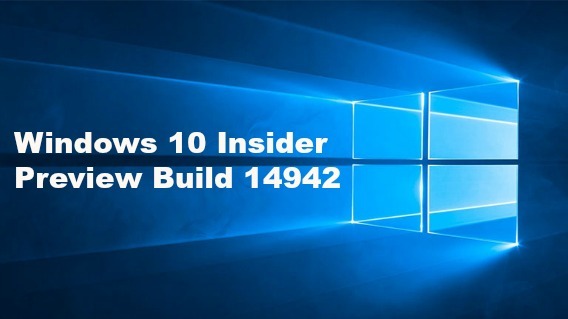 Here the details what’s fixed and improve, and known issues in Build 14942. We’ve updated Narrator’s reading order for Windows 10 apps which display an app bar on the bottom of the app, for example OneDrive, so now the contents of the page will be read before the contents of the app bar. We fixed an issue resulting in certain areas of Windows 10 app notifications not doing anything when clicked, rather than opening the corresponding app. We fixed an issue resulting in Personalization > Background Settings page crashing or showing a blank context menu when right clicking one of the recent images . Fixed an issue resulting in Windows Defender’s Antimalware Service Executable sometimes using an unexpectedly large amount of CPU. We fixed an issue resulting in the Devices and Printers page in Control Panel loading slowly for users with certain audio devices. We fixed an issue resulting in a small set of users seeing the NTFS partition of their external hard drive incorrectly showing up as RAW format. Going forward from Build 14942, custom printer names will be preserved across upgrades. We’ve also addressed an issue where the printer queue name wasn’t preserved across upgrade for some printers. Improved framerates when Game Bar is enabled for full screen games. Reboot the system, so that the W3Svc and WAS services share a service host process.